I feel like a character in a movie today. You probably know the one, he’s from “Men in Black”, the first “Men in Black”, and he’s an alien. But, that’s not why I feel like him – actually feeling like an alien is pretty common for me – it’s the fact that he’s constantly getting his head blown off, growing it back and then saying how much he hates it and how it gives him a headache every time it happens – at least I think he gets a headache, I know I do! It’s almost like living in another movie, “Groundhog day”. And, although there are many moments in my life that look like they’ve been put on permanent repeat, this one happens every once in a while and it has to do with doughnuts, yes, I said doughnuts. Now, I like most other people I know really enjoy a doughnut every once in a while. And, even though my mouth likes them, my hips do not, so I try to limit my indulgence in the little sweet treats to only doughnuts that I really, really, really like. Those that I really, really, really like can actually be described in the singularity of maple glazed old fashioned doughnuts. In the last few months there seems to have been a run on these doughnuts in our local stores – not that I’m looking all that much, really – so when I happen to see one sitting by its’ lonesome self, I just have to take it home. But, here’s the catch, I don’t eat it. I wrap it up very carefully and put it in the freezer – never the refrigerator because the icing gets all slimy – until I have time to really enjoy it. This time is typically on a Saturday morning before anyone else in the house gets up, and I can sit enjoying a cup of coffee and a little slice of Heaven on my favorite plate because after all, it’s the little things in life right? 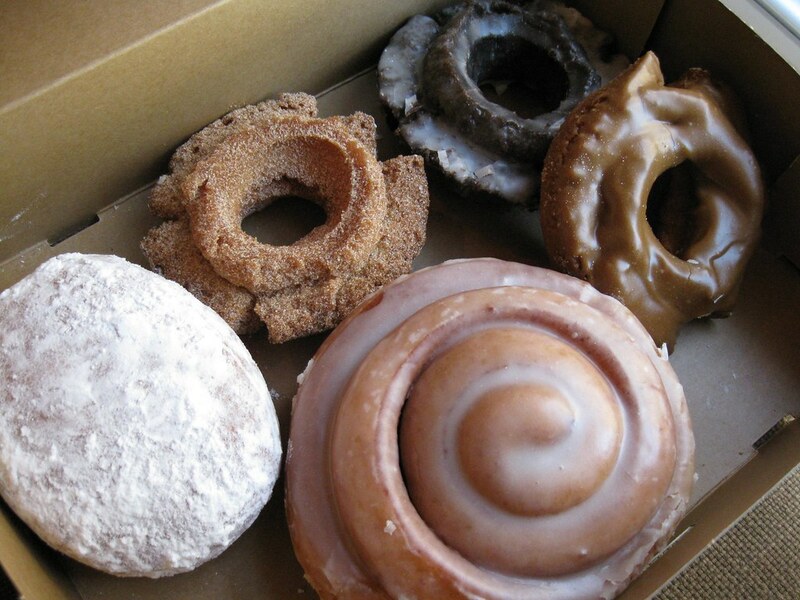 But lately, my doughnuts have been disappearing from their carefully selected spots – uh, spot - in the freezer. This happened the first time quite a while ago, I was looking forward to my doughnut and coffee only to find it wasn’t there. I pulled everything out of the freezer – taking the time to get rid of some things that really needed to meet the garbage pail at the same time, two birds with one stone and all that – and it was nowhere to be found. It was only when I went to throw away said freezer items that I saw it, my doughnut had someone managed to meet its demise in the middle of the night. I knew who the culprit was, there were only two suspects – four if you include the cats - but since the cats don’t have opposable thumbs and my son doesn’t throw anything away unless he’s specifically told to do so, the evidence pointed straight at my mom. When I asked her about it later in the day, she showed no remorse commenting that it just looked like, “an old thing in there that needed to be thrown away.” I asked why she didn’t throw anything else away only that, and she just shrugged. I sighed, determined to make sure it didn’t happen again. It did. In fact, all you have to do is press repeat on the above scenario, and you’ll get the picture. Every time I ask my mom to please not throw my doughnut away, she says okay then somehow forgets about it in the middle of the night, and when I try to find my doughnut at a later date, it’s gone. Sometimes I think it may be God making sure I don’t eat the doughnut because He’s trying to remind me of the saying, ’over the lips and forever on the hips’. But I don’t really think so, because, quite frankly, He’s just not like that. But, I am hoping that when I get older, I don’t forget that I put my doughnuts in the freezer and end up throwing them away myself. JoMa’s Artisan Ice Cream is a perfect sweet treat. Sometimes you just want a little treat. There are a lot of reasons for that, hard week, hard day, hard minute, or you just want a little something to sweeten up your life even for a moment. My mom has long been into little treats, one of her life mantras seems to have been, “treat yourself” a mantra that I haven’t really inherited except when it comes to chocolate chip cookies for my son, or as I affectionately call him, “the boy” – and yes, sometimes I sneak one or two of those same chocolate cookies in middle of the night raids on the freezer. I did say freezer because we like our cookies cold! With high temperatures in California and in the rural hamlet we live in, today seemed the perfect day for having a little treat. My mom isn’t feeling well, and my son had college applications to think about, but, after our weekly dump run along with the listing of said colleges and their application procedures, I told him we’d try out the new ice cream place in town. Lest you think this is a regular ice creamery, it’s not. It falls into the new fangled artisan ice cream shop where the creamy concoctions are handmade with fresh ingredients more local than far flung. I hadn’t actually been to our artisan ice creamery before, but had seen crowds gathering outside of it every weekend since it opened about a month ago give or take a week or two – I’m not exactly sure when it opened because sometimes I just lose time. To be fair there is another artisan ice creamery in our general area by the name of Munnerlyn’s that opened about 7 years ago – I know that for sure because I’ve written a couple of stories about it through the years - but since its about an hour or more from our home it’s not really practical for a little treat. With my son game for trying something new, and my mom resting but always up for a little treat, my son and I made out way up Main Street to JoMa’s Artisan Ice Cream leaving my mom behind for a few minutes because she wasn’t up to the adventure, but would no doubt enjoy its results. A few minutes – yes, I said minutes - later we arrived outside the ice creamery, a few minutes that felt a lot longer as my son – my teenage son – complained about the heat, the fact that we were walking and the amount of people that were around – cue my eyeroll! As we stepped in, I immediately loved its contemporary modern décor with its clean lines, and its very large lettered menu that you could see from anywhere in the shop. Just a few people were in front of us, and my only dilemma was what to choose for my mom. My son does anything mint and chocolate so that was easy, and I love salted caramel so that was another slam dunk because both of those flavors were on the menu – did I say I loved the menu where I didn’t have to work to figure out what was what? Yes, I know I did but it’s worth saying again! So after pursuing the menu a few times more, I settled on vanilla bean and honey for my mom. As we walked out of the shop, our little cups in tow, I wondered if the heat would melt my mom’s ice cream too much. So, I watched it pool a little bit on the way home as my son ate his quickly and efficiently, enjoying every creamy bite once he got used to the artisan flavor of it, which is more than a little different from what most of us are used to. I saved mine to have with my mom, who instantly proclaimed that it was “Delicious” when I gave it to her with only a slight moat of creamy sweetness surrounding the rest of the ice cream in her cup. Yes, sometimes we all need a little treat to sweeten up our day, and it’s all the better when you can just walk down the street for it. Third Time’s a Charm, or Should Be….